My name is Amy Walden. I am originally from Louisville, GA. I am 21 years old and a fourth year at the University of Georgia. I am majoring in Nutrition Science. I mostly compete equipped, but I have competed unequipped as well. I have competed in both the 181lb and 165lb weight class in the open and junior divisions. My last meet was Collegiate Nationals in Orlando, FL in April 2014. I placed 8th overall. My best numbers were 325lb squat, 165lb benchpress and 325lb deadlift. The American Open in December 2012. Form was a key issue as well as getting proper equipment and not being so nervous. I had to learn to be confident in myself and what I was capable of. Collegiate Nationals 2015 in Atlanta, GA.
For my last meet I had to cut almost 20lbs but for this one, I’ve done a good job at maintaining weight (158) so that won’t be an issue. It’s hard to cut weight and gain strength at the same time. I am located in Athens, GA and I train at the Ramsey Student Center on campus. I love watching football, hanging out with friends, and doing anything fun. Dan Green. He just doesn’t seem human. Before I got into powerlifting, I was really into agriculture and FFA. I competed in several forestry competitions (state, local, and national) and learned to identify every tree native to Georgia. I am a Strength and Conditioning manager at the Ramsey Student Center. It doesn’t really interfere with training or competing. School does a good job of that. I’ve always been interested in lifting and wanted to learn more about it. 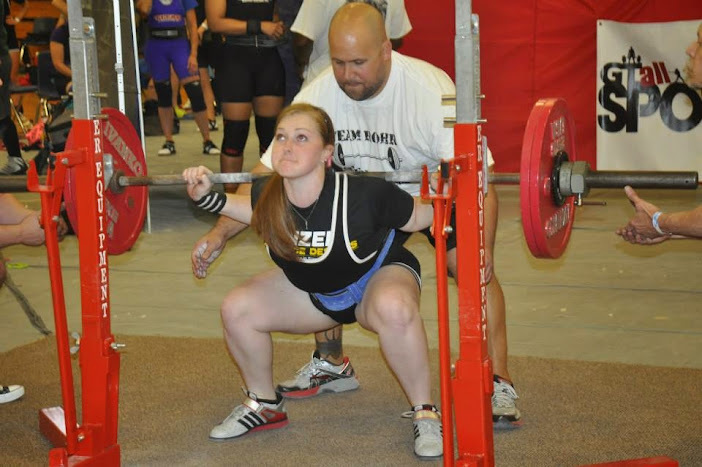 When I got to college, I looked for some type of lifting club to join and that’s when I discovered powerlifting and fell in love with it. I am the Vice President of the UGA Powerlifting Club. We recruit others to our team and assist them with training and competing. Squat- 325, Bench- 165, and Deadlift- 325. Those are my best competition numbers. Learn proper form from the start. It makes the lift easier when you start adding weight and it prevents injury. Also, don’t worry so much about not being strong enough or ready to compete. Everybody has to start somewhere. I’ve always loved competition. Plus it was something I had never done before and I love new experiences and trying new things. It also really motivates you in training because it gives you a goal and something to train for. I always try to get the most out of every workout. I don’t want to leave knowing I didn’t put everything I had into it. Right now, I squat and bench three times a week and deadlift twice a week but not heavy each time. I’ve started including a lot of accessory work and doing more RDLs and rack pulls to increase my deadlift, which has always been my weakest lift. Squat for sure. That’s the lift that I’ve always been the best at. Myself. I always want to get better and stronger and beat my own numbers.